يقع فندق Ocean Plaza Resort، المصمم ليناسب كل الضيوف سواء كانوا من رجال الأعمال أو السياح، في مكان ممتاز في أحد أكثر المناطق تفضيلاً في كولانجاتا. إن موقعه الجيد الذي يبعد 1 km فقط عن مركز المدينة يساعد النزلاء على الاستمتاع بمعالم المدينة ونشاطاتها. يوفر الفندق بفضل موقعة الجيد وصولاً سهلاً إلى أهم معالم المدينة.
. يعرف Mint Resorts & Apartments بالمستوى الراقي لخدماته ولباقة موظفيه، وهذا ما ستجده في Ocean Plaza Resort. هذه بعض الخدمات الموجودة في هذا الفندق: واي فاي في المناطق العامة, مرافق للشواء, جولات, مصعد, جهاز بيع آلى. بالإضافة لهذا,تتضمن كل غرف الضيوف مجموعة واسعة من وسائل الراحة . بعض الغرف توفر حتى تلفزيون بشاشة مسطحة, صوفا, مرآة, غرف لغير المدخنين, مكيف هواء لإرضاء أكثر الضيوف تطلباً. يقدم الفندق خدمات رائعة كمثل حوض استحمام ساخن, مركز للياقة البدنية, حمام سباحة خارجي, سبا, ملعب تنس لمساعدتك على الاسترخاء بعد نهار طويل من النشاط والتجوال في المدينة. استمتع بخدمات لا يعلى عليها وعنوان ذو اعتبار في Ocean Plaza Resort . Glasses filthy, looks like they weren’t even washed, blinds in 2nd bedroom didn’t close properly letting in the morning sun, and no ceiling fan or aircon in there, however there was a stand up fan. Couch was also pretty dirty in lounge. View and location along with price was excellent and I would stay there again without hesitation. All considered, 9 out of 10! We have stayed at Ocean Plaza many, many times. You cannot beat the location - close to shops, across the road from the beach, good cafes and restaurants. The cinemas are also in the same building as is Woolworths supermarket. We stayed on the 15th floor this time and the view amazing. We had a two bedroom, clean and comfortable unit. The block also has a good size pool and BBQ facilities. The decor is more 90s and the facility is pretty dated. However, that being said it offers a huge sized accommodation which will benefit those with family trying to get away from the bustle of Gold Coast. a few minor problems obviously not reported by previous guests, leaking tap, broken water jug, missing plug for kitchen sink, security very poor not explained why. Location is brilliant. We were on the 7th floor this time and would have preferred to be higher like last time. Apartment was very well equipped and clean. Beds were fine. Although there were many TV channels the reception when on Foxtel was not very good, but good if switched to local channels. Lovely pool, but we found it to be too cold for us. All in all a lovely stay and would stay here again. Usually complexes like this one inform you if you're on a lower floor or on top on the pool area. If this is what you get booking through Agoda here, forget it. Apartment 4-9 was a zoo…Looking across the pool deck to the ocean as they looked in at you. Every splash and squeal was heard. We'd come to do whale-watching from the balcony... The pool was offically on floor 3 but then ten steps up to a mezzanine on level with this apartment. I didn't find any refence to this and it was only with careful assistance my elderly parent finally decided she'd brave it. A different set of steps to the BBQ area. This should all be noted for older folk. We also saw people with toddlers struggling. The apartment in itself was fine. Absolutely loved the accommodation and position , views magnificent . 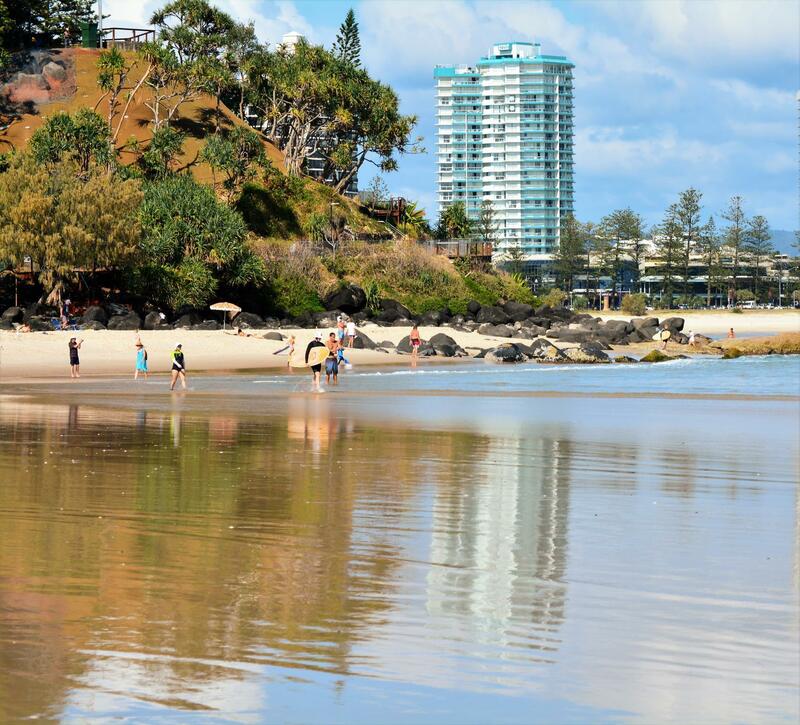 We would highly recommend Ocean Plaza for anyone who is going to Coolangatta close to buses , resturants ,and Sunday market on the beach in front of you . It was the second time staying there. So convenient park the car & never have to take it out of secured parking during stay. Stayed on western side of building wouldn't like it in summer as it gets full blast of afternoon sun.Also no hairdryer in master ensuite& no garbage disposal but the sign was still insitu & a big one if you live champagne like us there wasn't any champers glasses 😝. Will stay there again for sure. We have stayed here many, many times. Location - perfect. Unit was on 16th floor and views amazing. Clean, comfortable unit. So close to everything you need - shops, good places to eat, beach across the road, very good pool and BBQ area. $15-20 cab ride from Gold Coast airport. My only complaint is that we never want to leave!! No complaints would book again. Stay was good the room however was very outdated, dirty and dangerous.